Dinosaurs and more-traditional fare feature at Silvers Circus during the holidays. Dinosaurs have stomped into Silvers Circus. 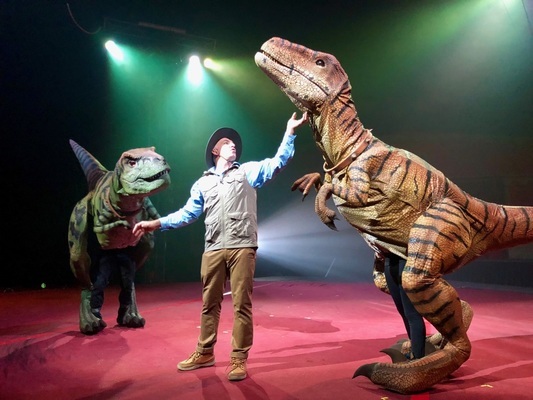 Circus-goers can now see one of Australia’s finest circuses along with everyone’s favourite prehistoric creatures all in one 90 minute international show. Families will now be able to enter the circus through a free dinosaur exhibition on their way to the 90-minute international circus show. “Be ready for these special prehistoric creatures to also pop in to visit during the performance,“ Silvers says. Owned by Swiss-born Anna and Anton Gasser, Silvers Circus has become a household name in Australia. After 42 years on the road, Silvers has evolved into one of the top 10 circuses of the world. Silvers maintains all the sparkle, glamour and death-defying acts expected of Australia’s premier circus, dedicated to constant innovation and modernisation with extraordinary artists continually arriving from all parts of the world. Silvers Circus presents a line-up of stunning international artists, Las Vegas-style illusions and captivating production techniques. The 90-minute action-packed show includes personalities and events such as the Wheel of Steel, the Globe of Death, Lidiya Dawed Ebrahim, the Jratlou family, Hula Hoops with Gypsy Gomez, Comedy with Picolo and Monchito, Daniel Vilar, magic and illusions, Yonas, the Yeneta Bros. and the ringmaster. Jurassic Unearthed by Silver’s Circus is showing on the Prines Hwy, Waurn Ponds, from 5 April until 5 May. For all show details visit silverscircus.com.au.